By making your database form public and letting 'outsiders' create new records by filling it out. 2. Fill out the fields and click on 'create record'. After you do, you'll see a new row at the bottom of your database with the information you inserted. 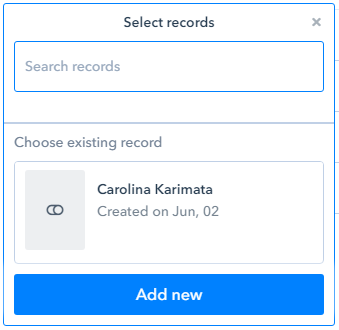 Before you can create new records from within a pipe, you need to set up a connection between the pipe and the database or create a connection field in one of your pipe's phases. Let's assume we want to connect a sales pipeline to the database where we store our customer records. We want to use the pipe and the database together by linking opportunity that enters our pipeline to a database record. 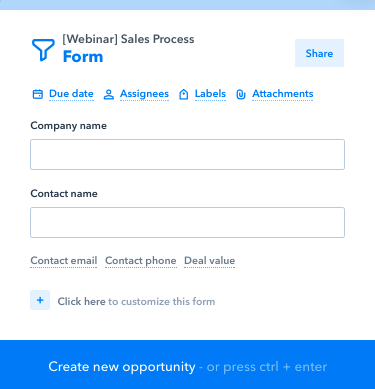 In this case, the best thing would be to add a connection field to the sales pipeline's start form so that every time we fill out the sales pipeline's start form, we'll also be able to create a database record. 1. 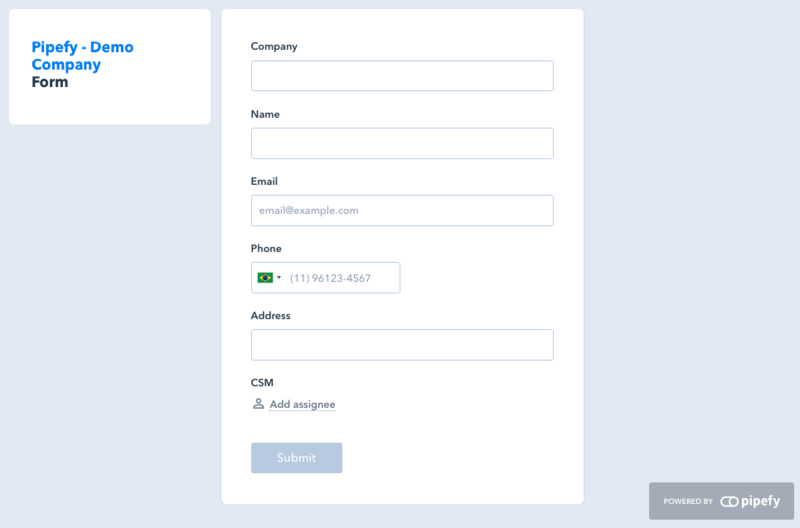 The first thing you need to do is open the sales pipeline (or any other pipe you wish to connect a database to) and select the phase you want to connect to the database to create database records. In our case it's the sales pipeline and I want to start creating/linking records from the pipe's start form. The first thing you'll do is give this field a name (field label). In the sales pipeline case it will be 'Create customer record'. The next step is selecting the table you want to connect to. I am going to select the table 'Customer records'. The next two steps are related what you want to use the field for. You can determine the field's function: search, create or search and create records. 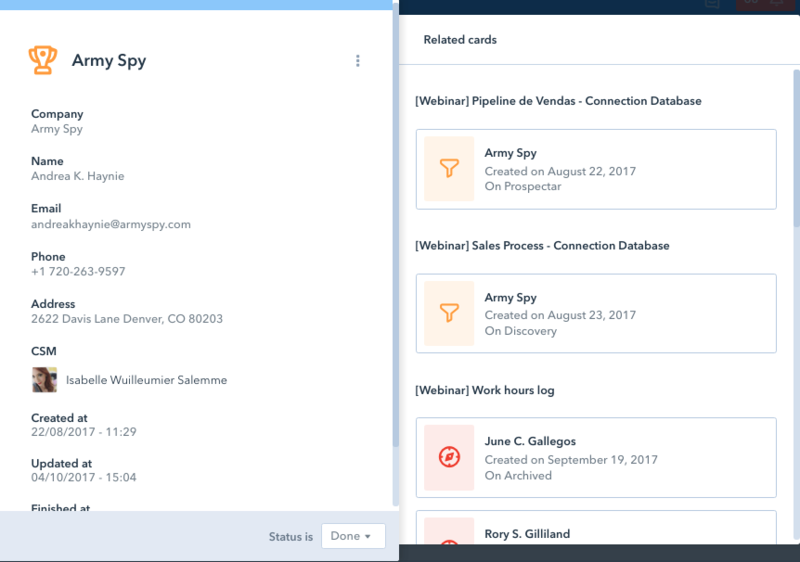 If you opt for "search records", the field will only allow you to search for the existing database records and one (or more) of them to your card. 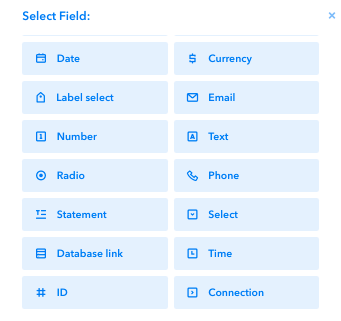 If you choose "create records", the field will only allow users to create new database records by filling out the form. If you select "search and create" you'll be able to do both. We'll select 'search and create' so that we can search the database to see if this customer already has a record and, if he/she is not registered, create a new record. 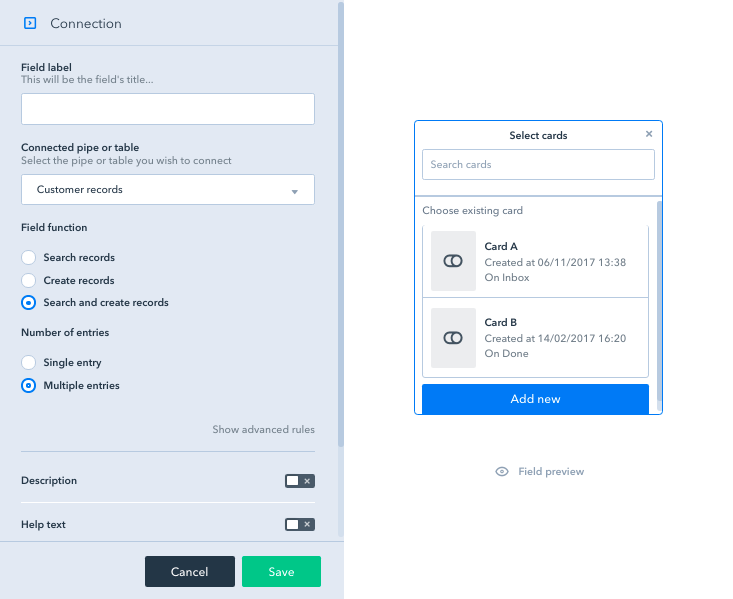 The next option determines whether you want a single database entry to be connected to each card, or multiple entries. We'll choose a single entry so that a single customer record will be connected to each card in the sales pipeline. In the 'advanced rules' portion of the connection you'll also be able to setup autofill so that the record will automatically 'fetch' information from the origin pipe (in our case, however, it wouldn't work because we're inserting the information about the customer in the same phase the connection field for creating database records is in). Have you ever used our public form feature? 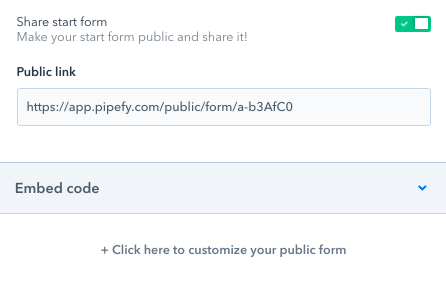 It allows you to make a pipe's start form public so that users outside of Pipefy can access it using a shareable link to create new cards. Besides the public link you'll be able to share with whomever you want, you'll also see the embed code and the option to customize the form's appearance. 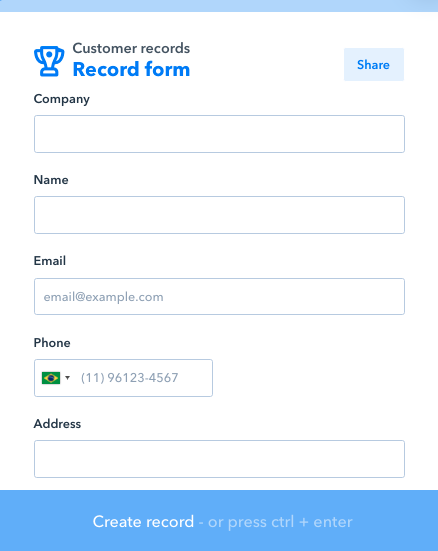 In the left side of the record you'll see the information added to the form when creating the record. In the right side you'll see all the cards this record has been connected to (divided by the pipes). To to so, click on the dropdown menu next to "status is" to change the record's status.